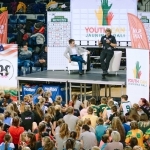 KFF program YOUTH CAN invited all to the first event of the season at the Kedainiai Sports Center. Over 300 program's students from various Lithuanian towns and villages showed off their basketball skills they've been practicing for the last two months. Famous Dakar rally racer and Lithuanian patriot, Benediktas Vanagas led two motivating discussions based on his life experience. One with program's youth called "You Can" and the second one with program's coaches “Teacher/Social Worker – Superhero”. The founder of dance company, “Confidance Chicago” Ziba Sidrys came to Europe this fall from the United States specifically to work with Youth Can staff and to visit our kids. The youth had a chance to hear about Ziba’s Lithuanian roots – how her grandparents ran from Lithuania during WWII and kept the Lithuanian culture alive within their family in Chicago. All students, coaches and guests participated in a flash mob dance led by Ziba. "Together with Kėdainių “Nevėžis” Basketball Club we have made Youth Can season opening event a true success. I truly believe it will stay with the boys and girls for the rest of their lives. It is really important that we give them opportunities to see beyond their small towns or villages so they can broaden their horizons," shared Arminas Vareika leading Youth Can program. This Youth Can event concludes the basketball program making way for new activities. All program‘s participants will start practicing ultimate Frisbee next week. In about two months they will meet again at another event – this time on the ultimate Frisbee court. 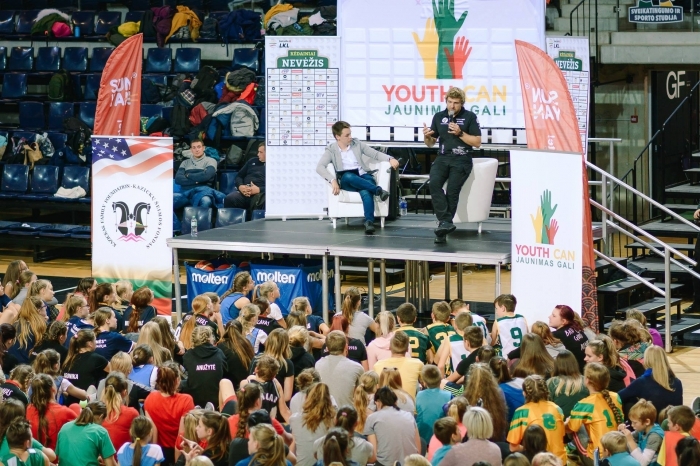 Through the entire season, the youth will learn the basics of four sports, will make over 300 friends from all over Lithuania and will get to hear inspirational life stories of famous professionals and motivating people. Thank you All for making this event happen!